Genuine Attestation Services is popular all around as efficient service provider of certificate attestation from Bahrain embassy. Embassy of Bahrain situated within New Delhi considered us trustworthy company for document authentication. We serve authentication purpose for all types of documents such as Educational, Non-Educational, and Commercial. Nations located all around Globe could be divided within two major sections in concern of Embassy or Consulate Attestation. The main divisions of countries are Hague Conventional Countries (HCC) and the non-Hague Conventional countries. When anyone plans to migrate to Bahrain either for doing job or for pursuing higher education, he/she needs to go through documentation process, where all of the documents including educational and non-educational needs to be attested from Bahrain embassy or Consulate located within India. Before getting document attested from Bahrain Embassy or Consulate, there is some obligatory attestation that needs to be done on original document from regulatory authorities of Government of India. Document will be attested first at Delhi Home department. Then, further attestation will be done at Ministry of External Affairs, New Delhi. 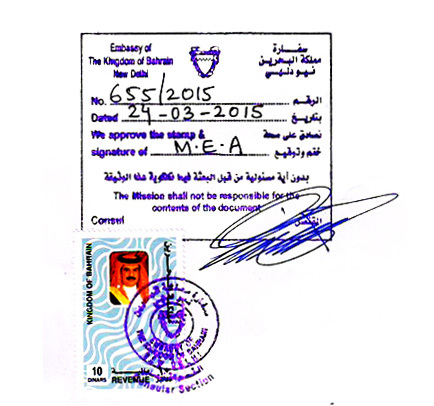 At the end, attestation process will end at Embassy of Bahrain, New Delhi. Attestation process will begin at Human Resource Development Department of respective state where document is originated. Thereafter, document will be attested at Ministry of External Affairs, New Delhi. Finally, attestation process will end at Bahrain Embassy located in New Delhi. At first, document needs to be attested from Home Department of the respective state of residence from where document has been issued. Thereafter, attestation of document will be done at Ministry of External Affairs, New Delhi. Final attestation will be made at Bahrain Embassy, New Delhi. Process of document attestation will begin at respective Chamber of Commerce. Attestation process will followed at Ministry of External Affairs. At last, final attestation will made at Embassy of Bahrain, New Delhi. It is followed by attestation made by Ministry of External Affairs, New Delhi. The last attestation is made by the Embassy of Bahrain, New Delhi. 1. It is essential to keep in mind that process of Degree Certificate Attestation from Bahrain Embassy or Bahrain Consulate is valid only for the original documents and that are originated within India only. 2. It will take maximum ten working days for the completion of Degree Certificate Attestation from Bahrain Embassy or Bahrain Consulate.